Canyonlands National Park in Utah may not be as famous as Arches, Bryce, or Zion, but that doesn’t mean it’s any less impressive. Quite the contrary, if you ask me. Set in the high desert, the canyons, mesas, buttes, and arches have been slowly shaped by water, gravity, and the elements over millions of years. 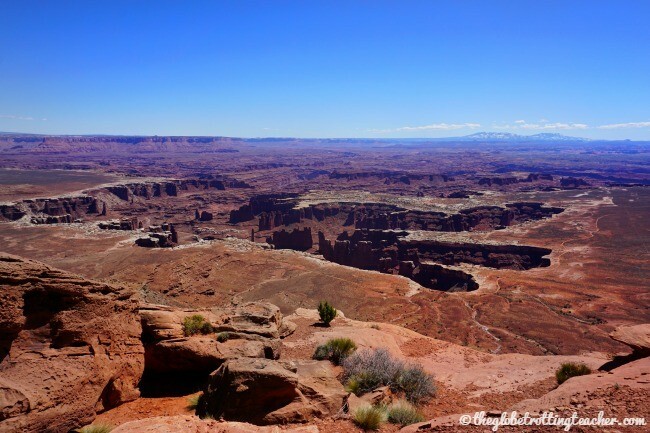 Canyonlands has a decidedly wild, unrefined feel. The rock formations and desert landscape have a harsher, rougher feel than its nearby neighbor, Arches National Park. 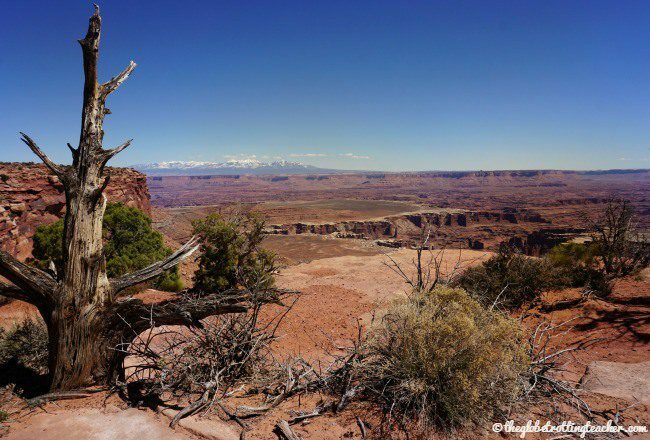 Canyonlands National Park is divided into 4 districts, Island in the Sky, the Needles, the Maze, and the Rivers. The districts are separated by the Colorado and Green Rivers. Island in the Sky is not an island, but rather a mesa with access to the sweeping landscapes of the 1,000-foot canyon down below. This section of the park is the most visited. 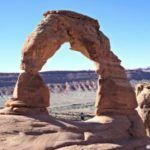 It’s the closest to Moab, just about 30 miles away, and has the most accessible terrain of all the districts. The Needles section of the park is south of Moab by about 40 miles, while the Maze is remote, rugged, and best for those who are experienced in the backcountry. I visited the Island in the Sky. 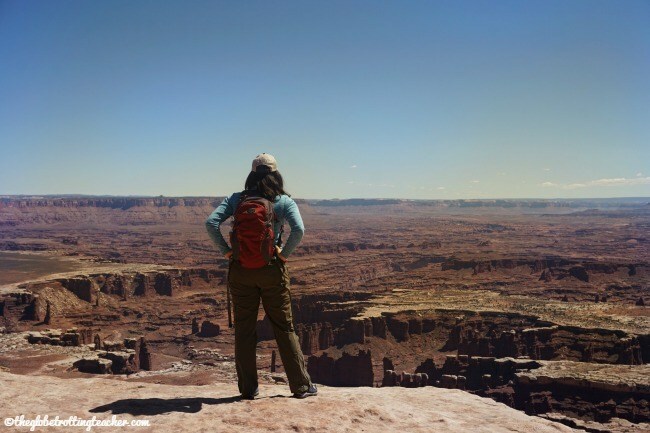 Certainly, Canyonlands has its fair- share of heart-pumping outdoor adventures. With the right car, I’d have loved to go off-roading. 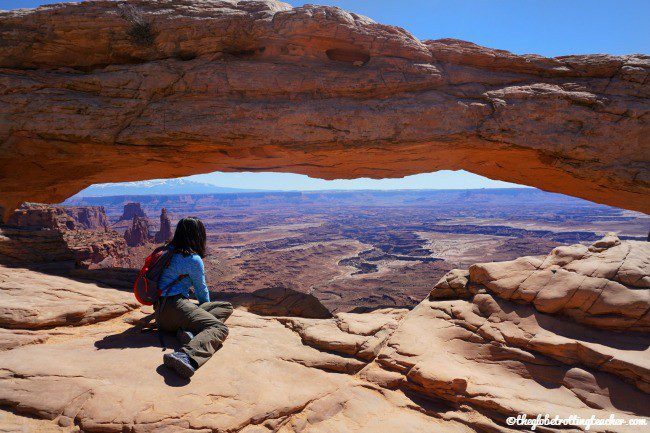 Canyonlands, though, reveals its beauty instantly and without hesitation because of its high perch over the canyon and desert below, also making it perfect for inspiration seekers, contemplation, and inward reflection. On the way to Canyonlands sits Dead Horse Point State Park. 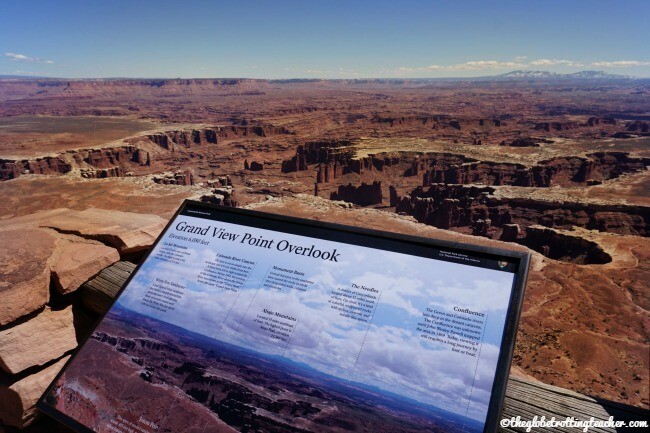 Make the detour into the State Park to see the stunning Dead Horse Point Overlook. The Colorado River cuts its way through the rock and carves the horseshoe-shaped bend in the river, as well as the surrounding canyon. Interestingly, though, this is not how the point got its name. Cowboys used the canyon to herd wild horses and take the best of the lot. The view from Shafer Canyon Overlook was my favorite. You can access Shafer trailhead here, too. 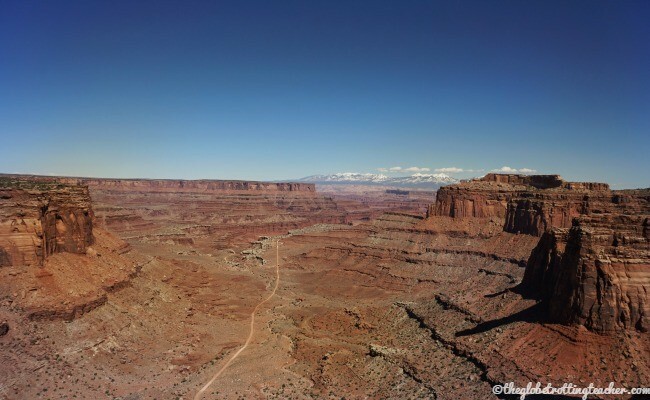 After stopping at Dead Horse Point, head into Canyonlands. The Visitor Center marks the start and finish of the 34-mile round trip scenic drive along the top of the Island in the Sky Mesa. Quite simply, the scenic overlooks are awe-inspiring. Plan to hop out and photograph each one. Unless you’re crunched for time, there’s no need to rush. Savor your surroundings. You’ll have plenty of time to drive the scenic road at a leisurely pace. If you want to hike, pay careful attention to the tips in the park guide. 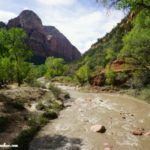 Many hikes include descending deep into the 1,000-foot canyon, making many of the hikes moderate to strenuous. Interested in putting that 4-wheel drive to the test? Be sure to get a permit to take your vehicle onto the park’s many dirt roads to explore the backcountry. Along the scenic drive, stop at the must-see Mesa Arch. The easy trail is about half a mile and should take about 30 minutes round trip. There’s an incline, but it’s gradual and descends back down a bit as you get closer to the arch. 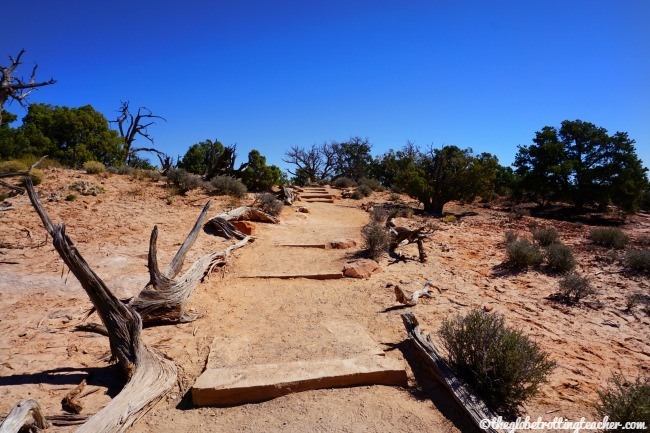 The trees in the desert and along the Mesa Arch trail are weathered and worn characters! 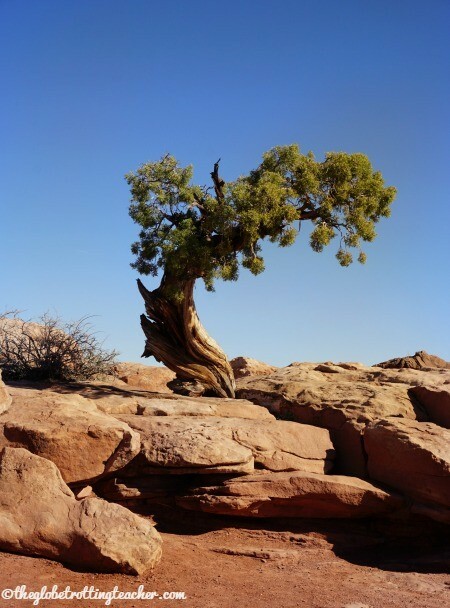 The severe conditions create curved, bent, craggy trees that are simply trying to survive in a region that sees less than 10 inches of rain per year! It would have been easy to stare out at the view from Mesa Arch all morning. Reaching Mesa Arch is well worth the view! Climb in and around (not on) the arch to contemplate every possible angle. But do be careful! The ledges are real and don’t have a fence or barrier to keep visitors from falling. Spots like these in our National Parks help to remind us of our place in the natural order. Canyonlands did this with ease. The landscape inspires and lends itself to quiet reflection with how vast it is! Grand View Point Overlook is a popular stop at the far end of the scenic road. 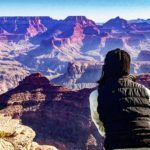 At the far end of the scenic road is Grand View Point Overlook, as well as the trailhead that winds you out and back along the edge of the canyon. 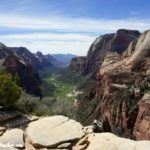 The 2-mile round trip walk is mostly flat and is accurately listed as an easy hike in the park’s guide. Walking along the canyon’s edge, it’s hard to comprehend how drops of water over so many years have created the natural beauty before you. How could you not wonder, if drops of water can create this canyon, what impact can we have with the right amount of pressure, time, and patience? 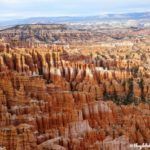 Are you planning a visit to the Utah National Parks? Find out how to save money on park entrance fees! This looks unreal! I’d love to go. What a beautiful National Park! The photos are wonderful, I love the photo at Dead Horse Point. 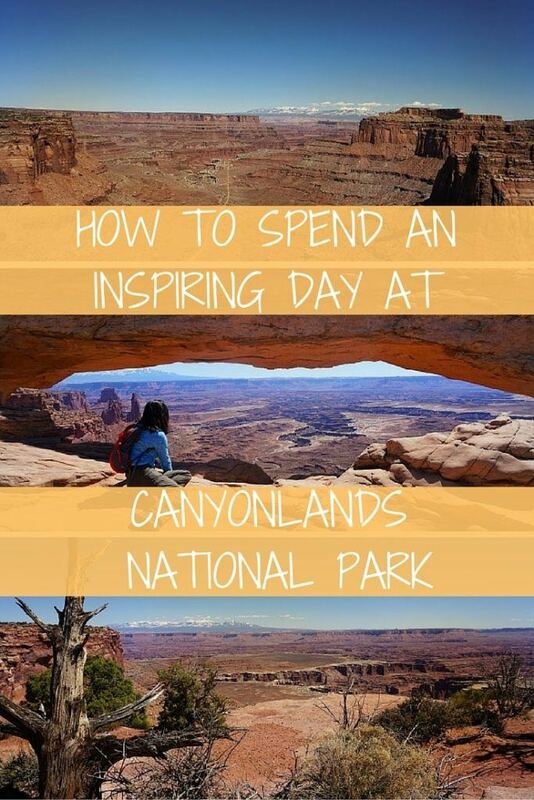 I have never heard of Canyonlands National Park but it looks like an awesome place to explore and maybe do a little camping with a 4-wheel drive. Some of the views remind me a little of Dinosaur Provincial Park in Alberta, Canada. I kept imagining dinosaurs roaming through the park, Rob! We wished we’d had a 4-wheel drive to explore on some of the backcountry roads! It would have been a great adventure! 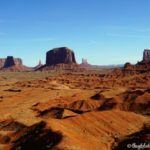 Hope you get to visit Canyonlands some day! Utah is really stunning and it has been over 20 years since I visited the area. I must go back again some day, it really is amazing landscape to hike, enjoy and photograph. Glad you’ve enjoyed the National Parks in Utah, Noel. Certainly a worthy part of the world to revisit! I really the photos you posted here. Now I know that the place is called Canyonland National Park. I always see that arch in the photos but never knew what is the name of the place. Would love to see it someday! Thanks for sharing this!! 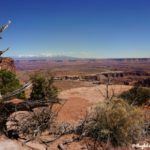 Canyonlands NP is so stunning – I can’t believe I have never heard of it! I love the rugged sandstone rock formations and the way the trees have adapted to the environment – the leaning, craggy look is awesome! I’m sad that I missed this on my trip! This landscapes looks a way in between the moon and a…. Tim Burton’s movie! Great shot and even Greater experience. Canyons definitely sounds ‘exotic’ here in Europe! Exactly, Sabrina! The moon is the perfect way to describe the landscape! 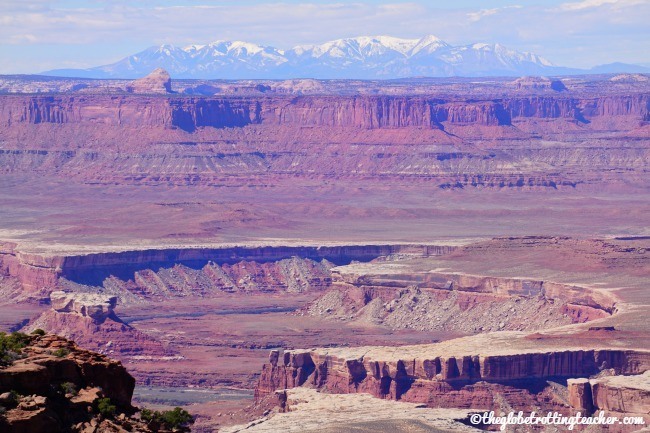 Hope you can make it out to Canyonlands and the other Utah National Parks some day! I love Utah! It’s one of my fave states to visit. 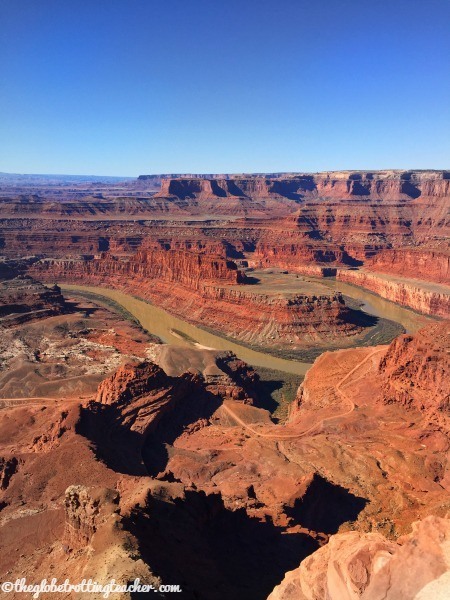 I’ve been to Dead Horse Point State Park and I thought it was beautiful. I wish I was able to visit Mesa Arch during my trip with my husband but due to time constraint, we had to forego that part of our itinerary. Utah looks really stunning! The nature and the cliffs/mountains look so pristine! And there are no people. 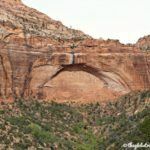 I will add Utah to my list – still waiting for my first chance to visit the US! Yes, Alice, Canyonlands was awesome! Lol about the cowboys…I actually kept imagining different things from cowboys, to Native Americans, to prehistoric creatures! I really enjoyed Canyonlands, even though we were there just for a morning. We drove there to witness the sunrise on Mesa Arch and it was an amazing experience, one of the most memorable ever! I’d definitely like to go back one day, as surely half a day is not enough! Half a day is definitely not enough, Anto! We actually wished we had a different car to explore on some of the backcountry roads so we’d like to return, too. That sunrise must have been incredible! The view from the arch is just breathtaking!